The objective of our project was to obtain research on various individuals who have used the Nutrisystem diet to try to lose weight. We interviewed individuals who have chosen this diet, but also individuals who have forgone Nutrisystem and chosen an alternative diet. Also, we found it important to identify the amount of individuals who contained had knowledge about of proper dieting techniques. In addition to taking interviews, we looked into how Nutrisysytem works and how an individual can successfully attempt to complete the diet. It was deemed necessary to identify the underlying mechanisms that this diet targets, and compare the large variety of scientific studies carried out using dieting. We determined that Nutrisystem focuses on a diet that is graded low on the glycemic index and focuses on restricting carbohydrate intake rather than fats. There have been many studies that compare the biochemistry and weight loss programs that focus on low-carbohydrates or low-fat diets. Overall, we observed that studies indicated low-carbohydrate diets were healthier than alternative dieting methods. This information was finally connected to the public opinion of the diet to explain why it is a popular choice for individuals interested in weight loss. In the final steps of our research, we analyzed the public view of Nutrisystem as well as diets that target similar mechanisms for weight loss and described their role in society today.In the abstract there should be some, very general, indication of what you found in your research. The purpose of our research was to determine the effectiveness of the Nutrisystem diet compared to other, more conventional low-fat alternatives. Early on, we discovered that Nutrisystem targets the glycemic index, reducing carbohydrate intake to promote weight loss. Knowing that, we then investigated how effective the efficacy of low-carbohydrate diets were, using and based our conclusions on multiple studies to base our conclusions off of. Our findings, with respect to the overall weight loss, were diverse. Some studies showed that those on low-carbohydrate diets lost more weight, while others claimed that the same amount of total weight was lost, regardless of the dieting method. One thing that seemed definitive and consistent throughout our research, however, was that lower carbohydrate diets were far healthier, and decreased the likelihood of diseases such as Type 2 diabetes. Low-carbohydrate diets also improved cholesterol levels, and facilitated "better glycemic control in patients with diabetes" (Stern et al. 2004). Overall, we concluded that while low-carbohydrate diets may not lead to more weight loss than low-fat ones, they are much healthier. In trying understand how the glycemic index and intake of carbohydrates affects weight loss and weight maintenance, we chose to first conduct a survey assessing individuals knowledge of the glycemic index. Then,we wanted to discover what their thoughts about the effects of carbohydrates effect on weight loss are. After examining our survey we then went on to interview a woman who had actually tried constricting her high glycemic index intake by using the Nutrisystem diet. When her results proved successful, we felt it necessary to speak with her and find out what made her choose Nutrisystem and why she felt she achieved success. Our survey was conducted on 70 female individuals of ages ranging from 18 to 22. The questionnaire initially surveyed our individual's knowledge of the glycemic index which then helped us assess their answers for the remainder of the survey. We then inquired whether each individual had ever dieted or tried to restrict their fat intake, and if so, how much. We finally questioned each individual who had restricted their fat intake to assess what their perceptions of carbohydrates were. This question would discern why someone might choose a diet that restricts fat intake over one that restricts carbohydrate intake. The interview was conducted on a woman in her mid forties who chose to go on the Nutrisystem diet in hopes of losing twenty pounds, and of starting a new, healthier lifestyle. She found that with the decrease in the amount of carbohydrates she took in daily, and a moderate amount of exercise, she was very successful. This suggests that reducing carbohydrates will increase an individual's weight loss prospects, contrary to the perceptions garnered from our survey. The above pie graph illustrates our survey takers' knowledge of the Glycemic Index, on a scale of 1-10. 90% of the people interviewed have at one point tried restricting their fat intake. The remaining 10% did not feel that they needed to. Of the 62 people who restricted their fat intake and on a scale of 1-10 in severity of fat intake restriction: 52% responded with a 5, 24% said 7, 8% put 8, 11% put 4, and 5% responded with 3. Would have been clearer to list these by severity of decrease in fat intake (1-10) rather than percentage I think. The vast majority of those surveyed answered that the intake of carbohydrates is good in moderation. Many included that carbohydrates are a vital part of an individual’s diet for energy. Some also stated that when they tried to lose weight, they thought about cutting out carbohydrates. With regards to carbohydrates effect on personal well-being, 46% believed that carbohydrates were healthy and necessary, 36% believed that carbohydrates provided more energy than fats, only 19% believed that carbohydrates hindered weight loss, and nobody believed that carbohydrates are unhealthy and should be avoided. Nutrisystem is a company dedicated to provide a weight loss program based on products and services offered by the company. The program uses a home delivery service of quality foods and a nutritionally balanced meal plan. The goal of the program is to use a diet that is low in the glycemic index in order for men and women to lose weight. This is based on previous studies which indicate high-glycemic index diets have been associated with obesity (Rossi et al. 2010). The glycemic index measures the effects of carbohydrates on blood sugar levels including the glycemic response which represents the rise in blood glucose after food intake (Pal 2011). Thus, the diet of Nutrisystem relies on carbohydrates that break down more slowly, releasing glucose more gradually into the bloodstream. Nutrisystem’s diet helps keep a person feeling full and allows them to burn calories more efficiently. Becoming a member of the Nutrisystem diet is easily attainable and starts immediately. There are plans specific to men and women which fall under the categories of Core, Silver, Diabetic, and Vegetarian (Nutrisystem 2012). Within each of these categories are a month’s worth of meals that can either be chosen by the participant or pre-selected by Nutrisystem. The daily calorie intake for participants is reduced in order for weight loss to occur. Generally, Nutrisystem diets support a weight loss of approximately two pounds per week (Hopwood 1995). After a participant reaches their target weight loss, Nutrisystem then provides diet plans to maintain that weight. 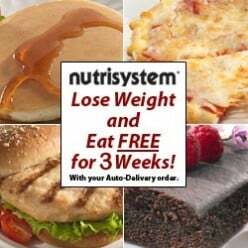 Although the information and claims provided by Nutrisystem's company website represent the diet as the ultimate means to weight loss, there are other scientific sources which analyze the effectiveness of the Nutrisystem diet as compared to other common means to lose weight. It was extremely difficult to find scholarly articles that pertained to the Nutrisystem diet. Fortunately, we were able to determine that Nutrisystem focuses on lowering the glycemic index of a person, which then results in weight loss and an easier maintenance of the lost weight (Rossi et al. 2010). The glycemic index is controlled by the intake of carbohydrates, so lowering this intake will effectively increase the amount of weight loss (Burton et al. 2011). There was a vast amount of scholarly research done on diets that are low in carbohydrates, and how effective these eating habits are in losing weight. There were also several articles that compared the effectiveness of low carbohydrate diets to ones that are low in fat, specifically "Weight Loss with a Low-Carbohydrate, Mediterranean, or Low-Fat Diet" and "The Effects of Low-Carbohydrate versus Conventional Weight Loss Diets in Severely Obese Adults". these should be cited by author and year to make them easier to find in the References Cited. These documents examine the weight loss experienced by people who have participated in each respective diet, and unfortunately, there was a small amount of ambiguity concerning which one generated the greatest amount of weight loss. Three documents claimed that after a prolonged period of time, there was little or no difference in weight loss between the low-fat and low-carbohydrate diets (Fabricatore et al. 2011, Pirozzo et al. 2003, Stern et al. 2004). However, several other articles claimed that a diet that is low in carbohydrates is much more effective in increasing weight loss (Blanco et Al. 1999, Shai et al. 2008, Delas 2011). While there is still contention between which diet is more effective in losing weight, there is little disagreement that eating habits that promote a lower intake of carbohydrates are healthier for participants than low-fat ones. Studies have shown that these low-carbohydrate diets have significantly decreased the likelihood of Type 2 diabetes (Jenkins et Al. 1992, Fabricatore 2011) and lowered blood glucose levels (Baldwin et al. 1981). It has also been shown that the low-carbohydrate diet had beneficial metabolic effects on the participants, and that "a diet with a healthful composition has benefits beyond weight reduction (Shai et al. 2008). Furthermore, "assignment to the low-carbohydrate group had a direct and more favorable effect on triglyceride level, HDL cholesterol level, and glycemic control..." (Stern 2004). It is important, however, to include a study that showed decreased health with a lesser carbohydrate intake. One study we found concluded that lowering the glycemic index in your diet may have negative effects on your mood and energy level (Ludwig 2002). The overall trend of the research conducted promoted weight loss with a diet that is low on the glycemic index. The data collected from the survey indicated that the perception of the majority of participants did not match the science behind the healthiness of the low carbohydrate and low fat diet. Most of the individuals did not feel knowledgeable of the glycemic index even though ninety percent of them tried restricting their diets. Of those who restricted their diet, their primary focus was to lower their fat intake rather than reducing their carbohydrate consumption. In fact, the survey suggested that individuals believed carbohydrates are healthier and provide more energy than fats which is opposite of the biochemical properties they contain. Although the dieters had alternate beliefs than supported scientific facts, the majority did understand that carbohydrates are best taken in moderation and, when done so, can aid in weight loss. Very interesting survey of the literature. Obviously this is a large and complex topic but you provided a good idea of some of the trends and disagreements. Diets such as nutrisystem, which are advertised as successful weight loss methods, have become an important aspect of our society. Nutrisystem focuses on lowering a person's glycemic index by restricting carbohydrate intake. Our research compared the effects of both a diet low in fat, as well as one low in carbohydrates. We concluded that although there is some contention between which diet is most effective in weight loss, the one thing that seems indisputable is that a low-carbohydrate diet is healthier than a low-fat one. It is very important to educate people about these findings. Physicians often play a role in overweight individual’s choice to lose weight, because they are highly influential regarding individual health care practices and are also a primary resource for healthcare information (Smith et al. 2011). By educating physicians, they can then proliferate spread this the knowledge to their patients. There has been a shift over the last 30 or so years to a cultural ideal of a more “angular and lean” body type (Garner et al. 1980). This shift is due in large to the media and its influences and has led to people, especially women, to believe that dieting is expected of them, and thus some take part in it diet unnecessarily (Germov, Williams 1996). If people know about the research that has been done, these weight loss methods can be done in a much healthier, safer, and natural fashion. Al-Zahrani, Ahmad, Blanco, Isaac, Dallal, Gerard, Ludwig, David S., Majzoub, Joseph A., Roberts, Susan B.
Baldwin, Janet M., Barker, Helen, Bowling, Allen C., Fielden, Hashmein, Goff, David V., Jenkins, Alexandra L., Jenkins, David J.A., Newman, Hilary C., Taylor, Rodney H., Wolever, Thomas M.S. Garner, D.M., Garfinkle, P.E., Schwartz, D., Thompson, M.
1995 My discourse/my-self: Therapy as possibility (for women who eat compulsively). Feminist Review 49:66-81. Jenkins, Alexandra L., Jenkins, David J.A., Josse, Robert G., Vuksan, Vladimir, Wolever, Thomas M.S., Wong, Gerald S.
2011 Understanding the Importance of Glycemic Index and Glycemic Load in the Managemnet of Diabetes Mellitus. Al Ameen Journal of Medical Science 4(2): 100-103. Pirozzo S., Summerbell C., Cameron C., Glasziou P.
Rossi, Marta, Bosetti, Cristina, Talamini, Renato, Lagiou, Pagona, Negri, Eva, Franceschi, Silvia, Vecchia, Carlo L.
2010 Glycemic index and glycemic load in relation to body mass index and waist to hip ratio. Euopean European Journal of Nutrition 49: 459-464. Smith, Ashley Wilder, Borowski, Laurel A., Liu Benmei, Galuska, Deborah A., Signore, Caroline, Klabunde, Carrie, Huang, Terry T.K., Krebs-Smith, Susan M., Frank, Erica, Pronk, Nico, Ballard-Barbash, Rachel. Stern, Linda, Iqbal, Nayyar, Seshadri, Prakash, Chicano, Kathryn L., Daily, Denise A., McGrory, Joyce, Williams, Monica, Gracely, Edward J., Samaha, Frederick F.
2012 Nutrisystem. Electronic Document www.nutrisystem.com, accessed April 2, 2012.